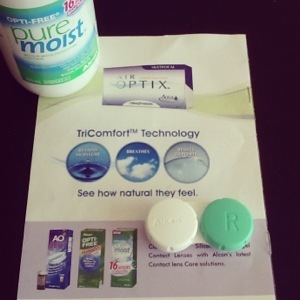 I stopped using contact lenses about three years ago. I was having a hard time reading things so I switched back to glasses full-time; that way I could remove them when I needed to read something. Yes, I’ve been in denial for quite some time now. I should have gotten reading glasses years ago, but I refused to. No granny glasses for me! 🙂 Well, thanks to a friend who recommended me to his opthalmologist, I will never have to buy reading glasses or bifocals anymore. 🙂 I went to see Dr. Abesamis last Saturday, she was very thorough and did a lot of tests, and finally gave me my prescription for multifocal contact lenses–that’s ordinary and reading glasses all rolled into one tiny lens. Amazing! The technology is fairly new here in Manila–I thought I’d have to go to the US to get them–so I was extremely excited to get my own pair. I finally got them yesterday afternoon. It’s still going to take a while to get used to, but no complaints here! 🙂 My doc says I should give it a week or two and go back for adjustments if need be. Well, we’ll see, but so far, so good!